Beth Ferrier spoke at our EVENING STAR QUILT Guild meeting last Wednesday. I was able to take pictures but to be honest I had a rotten angle and could not get the best shots of the quilts. Beth entertained us over an hour giving us the history of her quilting. She even showed the remnants of her first quilt. 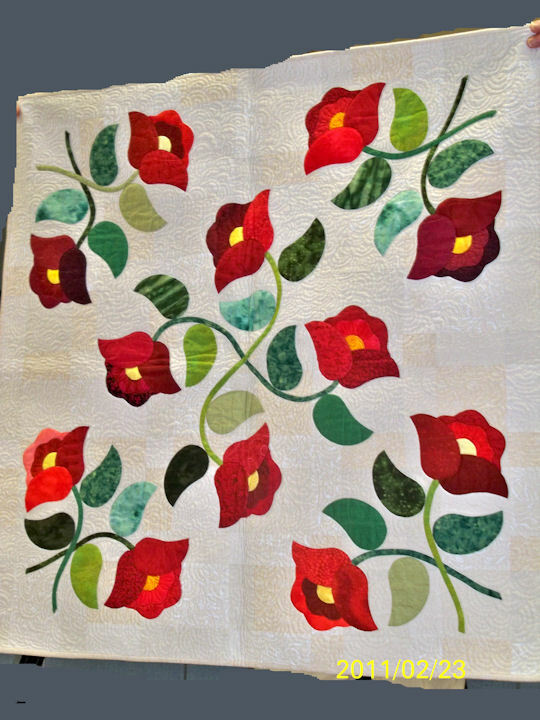 Her trunk show showed the growth of her quilting techniques from the beginner piecing blocks and class samplers to her first applique motifs to her growth in her machine quilting talents. Beth said, she wants her quilts to be entirely hers so she does all of her quilting on a domestic machine. Enjoy the pictures. I hope to post more in the future. AQS comes to GRAND RAPIDS MI for three year…. HAPPY DANCE!!! 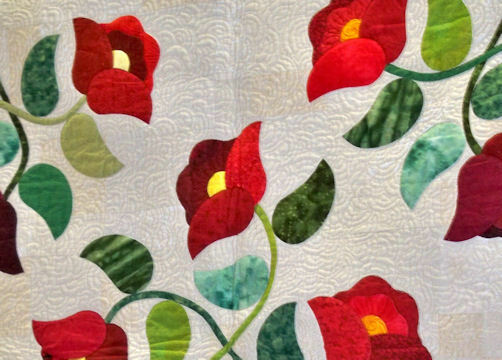 http://www.wzzm13.com/news/article/154576/2/Quilt-show-coming-to-Grand-Rapids AQS QUILT SHOW is coming to Grand Rapids ! ! ! I am over the moon. 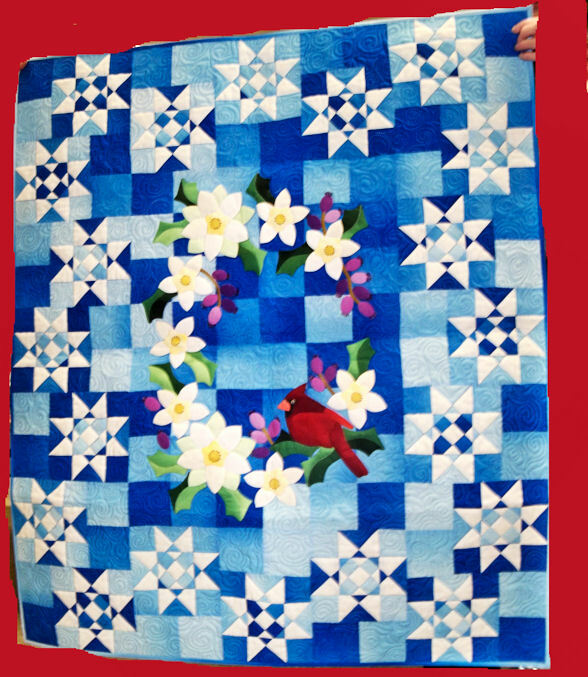 The AQS ( American Quilt Society) QUILT SHOW IS COMING TO GRAND RAPIDS, MI. My sister lives in Grand Rapids. Can you see the possibilities. Road Trip! Our guild hosted speaker Beth Ferrier and we got the treat of seeing her newest quilt project that will be in her upcoming books. I will be posting pictures from ther lecture ( with Beth’s permission) I will also be podcasting about the meeting and lecture. …. When…. SOON…. 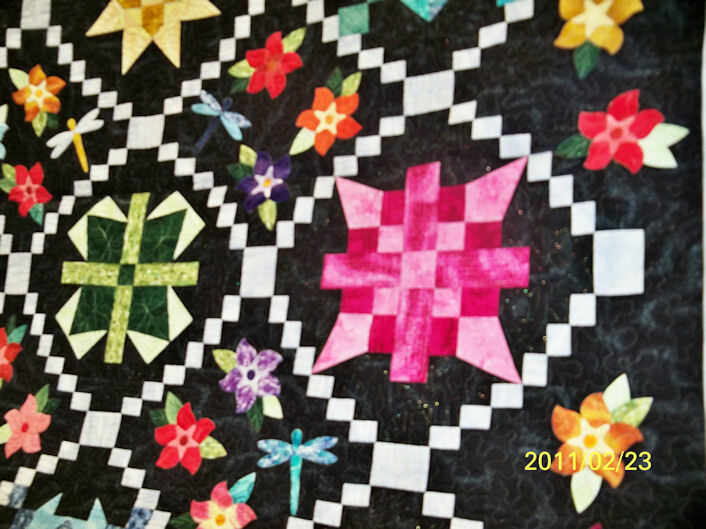 YOU KNOW YOU ARE A QUILTER WHEN ….. I never had a comment for Sandy’s QUILTING FOR THE REST OF US… YOU KNOW YOU ARE A QUILTER WHEN page, but now I do. 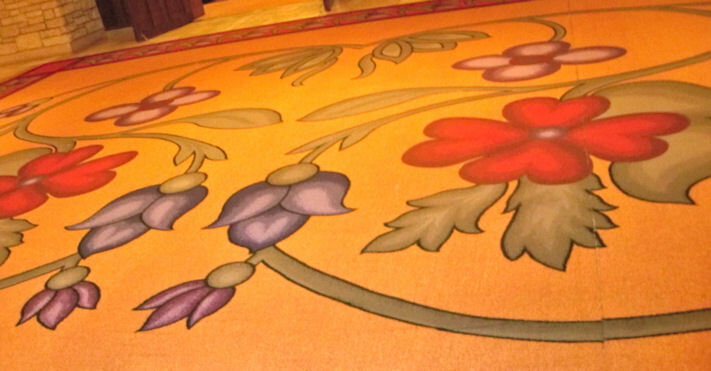 YOU KNOW YOU ARE A QUILTER when, you go to a casino and all you see are quilting motifs. In the art work, on the ceilings, the carpets, on the bedspreads, in the fretwork, even on your dinner plates, all I see are quilt related patterns and motifs. It seems that there is very few places I go that I do not see something related to quilting. Here are just a few pictures and I will be posting more. These pictures were taken at Soaring Eagle Casino in Mt Pleasant, MI. 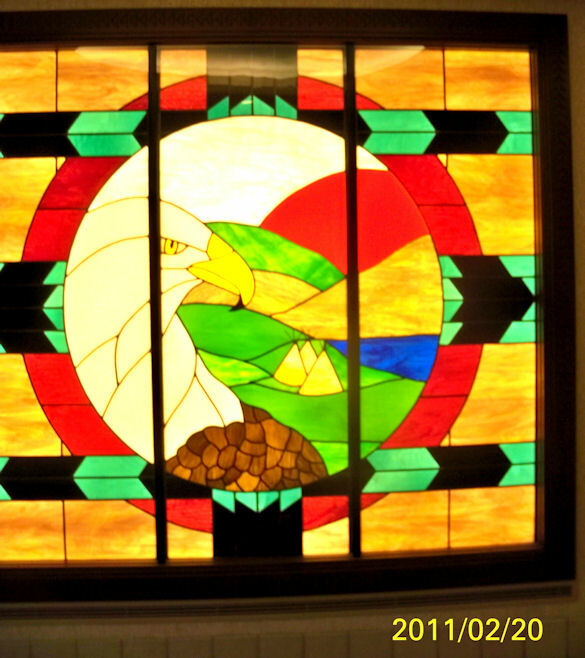 http://www.soaringeaglecasino.com/ They are representative of Chippewa Indian motifs. I have no way of knowing if they are accurate, but I have seen them in other context in galleries and museums. 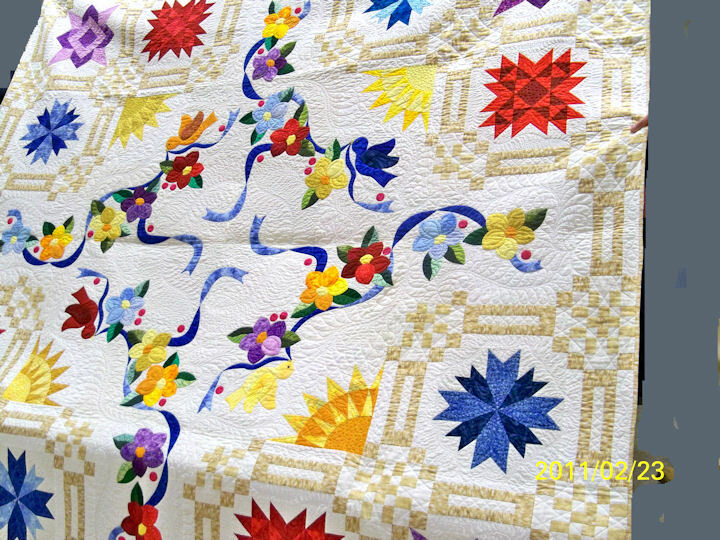 There are video and podcast interviews here of various famous quilters. 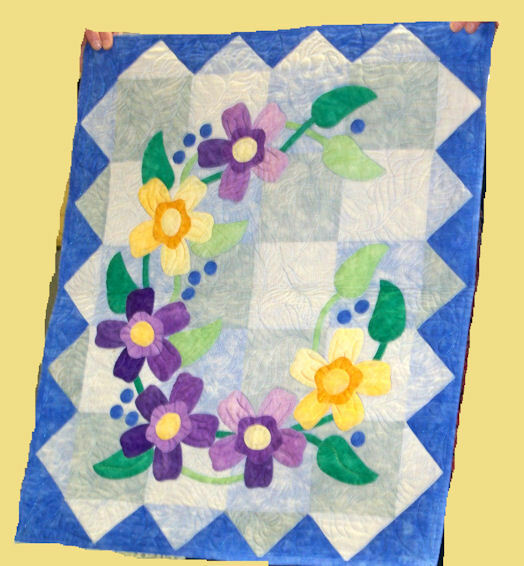 http://www.allianceforamericanquilts.org/treasures/ Quilt Treasures…. 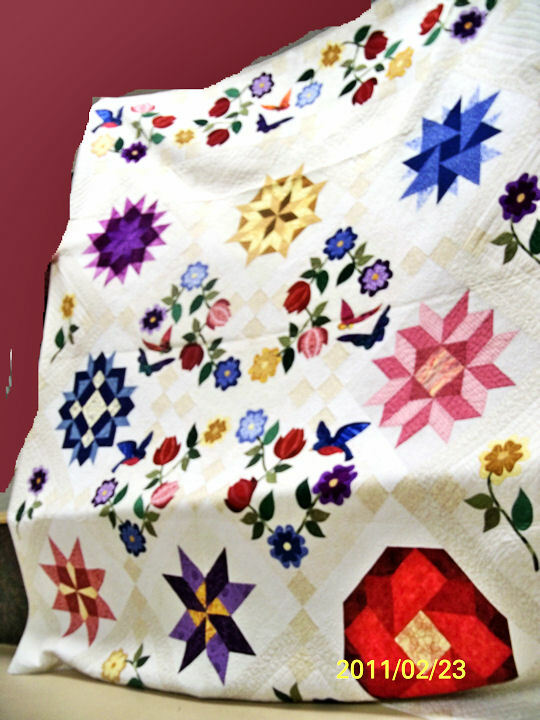 hidden jewel of podcasts and videos of famous quilter and quilt historians. 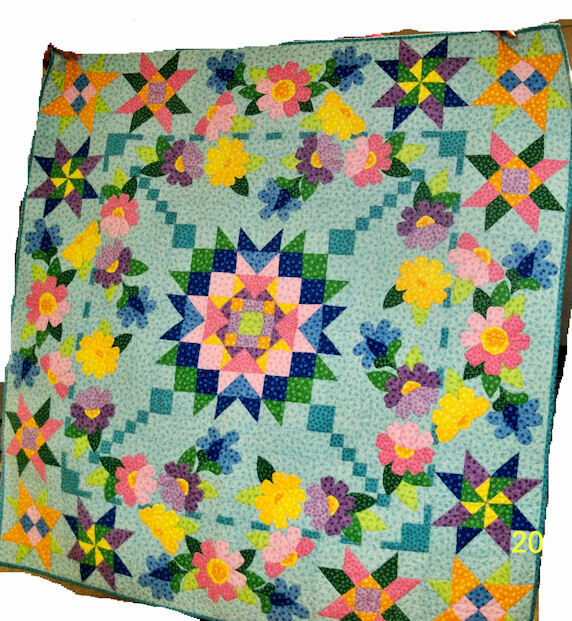 I found this link when surfing through, MICHIGAN STATE UNIVERSITY QUILT MUSEUM’S WEB SITE,I did not know they existed. 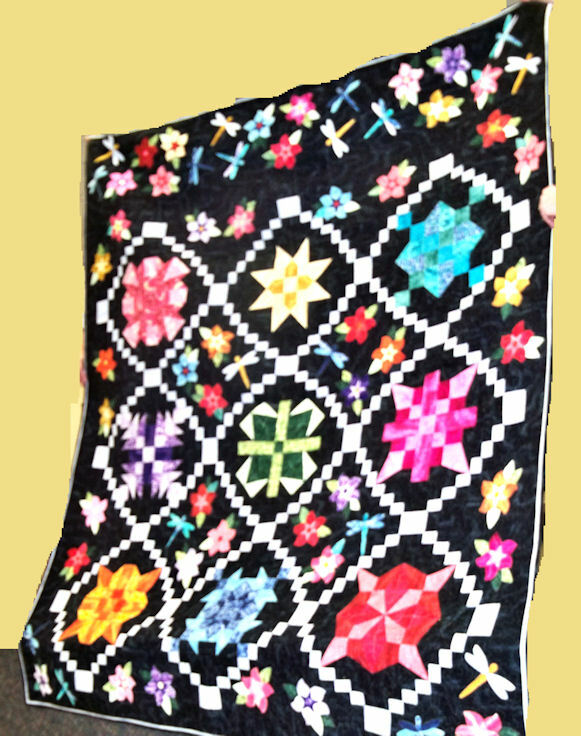 There are video and podcast interviews here of various famous quilters. This is part of the save our stories movement among the quilt museums and major quilt related associations. 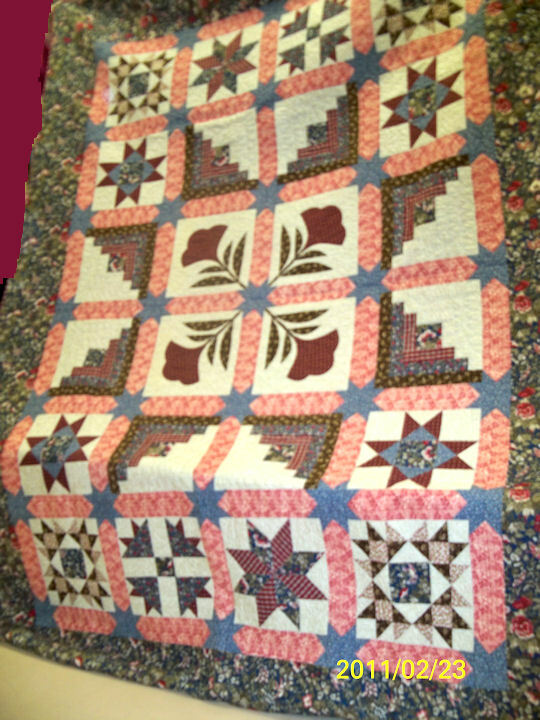 Take the time to look through the pages here and at the quilt museum in your state. I recently learned to make hanger and quilt labels all- in -one for wall hangings. Using your font decorative stitches, write out the information for your label on each of the corner triangles. 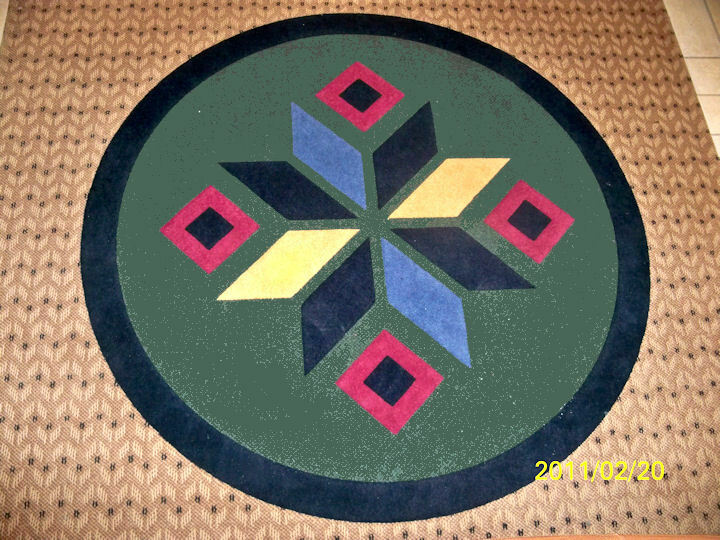 Place each triangle in the corners of your wall hanging. Raw edges in the corners. Baste into place. Put on your binding making sure to catch the triangles in the corners. Measure a dowel to the correct size of the quilt top. Wedge the dowel into/ under the corner triangles. 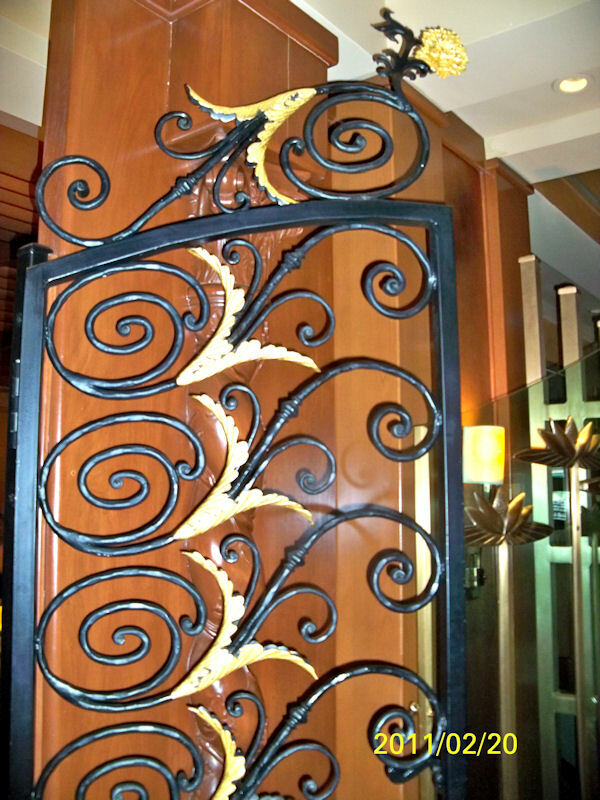 It can then be used to hang the wall-hanging. I have several small nails, several inches apart where I hang my wall hangings. My dowel holds my wall hanging neatly on the wall. If my wall hanging does not lay flat against the wall, I take a second (small / thin diameter) dowel and put them into the bottom corners and it helps hide a lot of sins. I will post pictures in the future but I have to buy some new dowels. Works great for quilt if you forget to put your label on before you get it quilted.